Tropical Storm Florence has hit North and South Carolina, knocking down trees, swamping streets with torrential rain, and causing four deaths before slowing to a pace that will lead to a days-long deluge for the region. Florence has weakened to a tropical storm, the US National Hurricane Center (NHC) said, adding that still life-threatening storm surges and catastrophic freshwater flooding are expected. "Significant weakening is forecast over the weekend and into early next week while Florence moves farther inland," the NHC said. The child's father was taken to a hospital. In Pender County, North Carolina, a woman suffered a heart attack and died when storm debris blocking roads prevented paramedics from reaching her. A fourth person was killed in Lenoir County while plugging in a generator, the governor's office said. 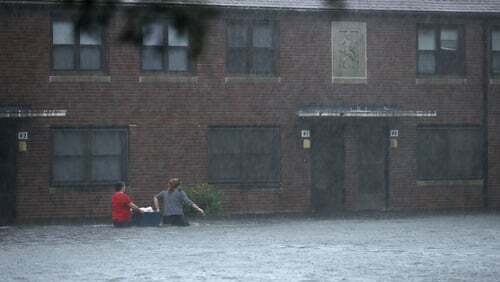 The storm surge - the wall of water it pushed in from the Atlantic - had "overwhelmed" New Bern, a town of about 30,000 people at the confluence of the Neuse and Trent rivers, North Carolina Governor Roy Cooper said. Mr Cooper said Florence would "continue its violent grind across the state for days." The centre of the storm's eye came ashore near Wrightsville Beach close to Wilmington, North Carolina, with sustained winds of 150kph, the NHC said. Mr Cooper said Florence was set to cover almost all of North Carolina in several feet of water. Video reports from several towns in the Carolinas showed emergency personnel wading through thigh-high flood waters in residential neighborhoods. Florence also blew down trees, including one that went through the roof of Kevin Di Loreto's home in Wilmington. He said all roads leading to his neighborhood were blocked by fallen trees. More than 634,000 homes and businesses were without power in North and South Carolina today, utility officials said. Utility companies said millions were expected to lose power and restoration could take weeks. Florence had been a Category 3 hurricane with 120 mph winds yesterday but dropped to Category 1 before coming ashore. It is expected to move across parts of southeastern North Carolina and eastern South Carolina today and tomorrow, then head north over the western Carolinas and central Appalachian Mountains early next week, the NHC said. Significant weakening is expected over the weekend. About 10 million people could be affected by the storm and more than one million were ordered to evacuate the coasts of the Carolinas and Virginia. Some of those who stayed went to shelters while others stuck it out in their homes. Amtrak cancelled its passenger rail service south of Washington, DC, and there were nearly 600 cancellations of flights arriving or departing from major airports in the Carolinas.